Erin Beauchamp and Jodi Newton (not pictured) opened Red Fox Vintage to promote merchandise that preserves the past. Photo courtesy of Red Fox Vintage. Red Fox Vintage opened in 2010 at 3014 N.E. Killingsworth St. and is owned by local women Erin Beauchamp and Jodi Newton. Both were vintage vendors who said they opened the shop to create a space that has a mellow atmosphere with great customer service and great shopping. Red Fox is similar to an antique mall, with different vendors renting space and selling from the store. It’s an eclectic destination for vintage shopping. The shop fits in with few retail stores in the area near 30th Avenue and Killingsworth Street. Inside, the owners reported, there is something for everyone: clothing, home decor, furniture, art, jewelry and accessories for shoppers to be inspired with creativity and individuality. 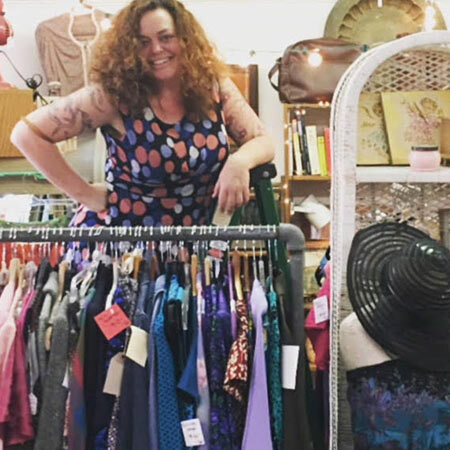 Across the past eight years, Red Fox became a well known vintage store here in Concordia and, due to its success, it expanded into a second location in the southeast Portland Woodstock area in 2013. The Concordia location is 1,500 square feet with 25 vendors, and the Woodstock location boasts 4,500 square feet and 60 vendors. According to Erin and Jodi professional vintage dealers from around the world frequent Portland and specifically Red Fox because of the variety of items available and the shop’s ability to showcase Portland’s unique style. The owners both say their favorite thing about the business is the community they have been able to create with all the vendors in both neighborhoods. Red Fox Vintage also gives back to the community and sponsors local teams and events. That includes the roller derby team the High Rollers, whose members once served as models for an event while skating around the shop. Red Fox frequently sponsors clothing swaps and donates to local women’s shelters. What’s the vision of the owners for their business’ future? Erin and Jodi smile and laugh. They subscribe to the movement to keep Portland weird. Find out more about Red Fox Vintage by visiting its Instagram sites @RedFoxVintage and @RedFoxVintageWoodstock.